Byzantium, Augusta Antonina, Nova Roma, Constantinople and eventually Istanbul have been the names of this city which has a history as long and glorious as that of Rome. Its traditional foundation (as Byzantium) is set in 667 BC almost at the same time as that of Rome (753 BC) and its name derived from Byzas, its first king (as Rome was named after Romulus). 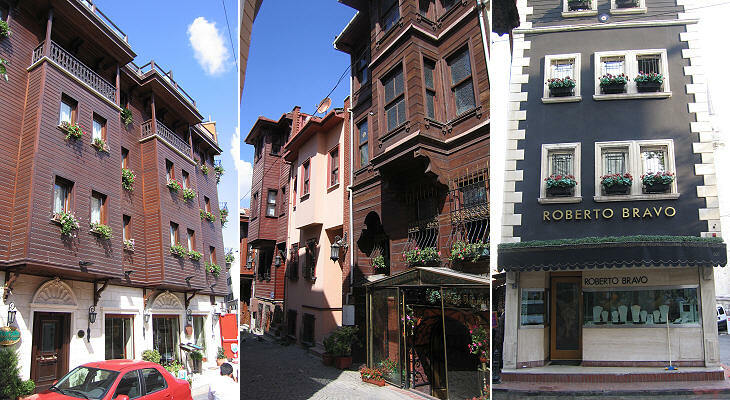 Istanbul is also similar to Rome in being built on seven hills. This section is aimed at illustrating in a concise manner the main monuments of the city; they are grouped according to the historical period they belong to. A page with a map shows their location. 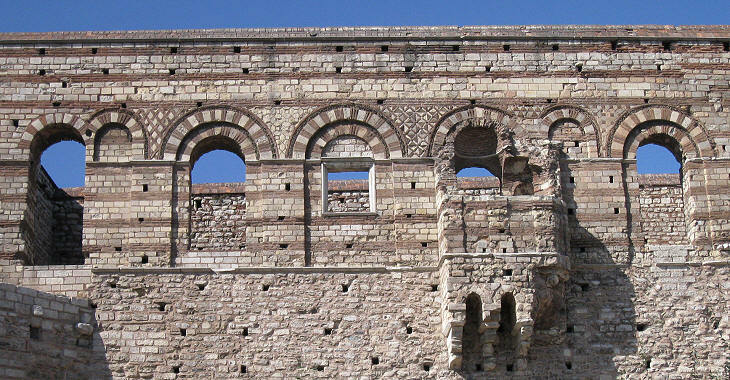 Separate sections deal with the ancient walls of the city and with Galata, a colony founded by the Genoese opposite Constantinople and now part of Istanbul. Dates in brackets after names of emperors or sultans indicate the period of their reign. The peninsula upon which the historical city is situated has the shape of a horn, but the Golden Horn is a narrow inlet of the sea between the peninsula and the European side of the Bosporus, the strait linking the Black Sea with the Marmara Sea (and the Mediterranean Sea). The Golden Horn was an excellent natural harbour where the small ships of antiquity could put into to wait for the appropriate weather conditions to sail through the Bosporus. 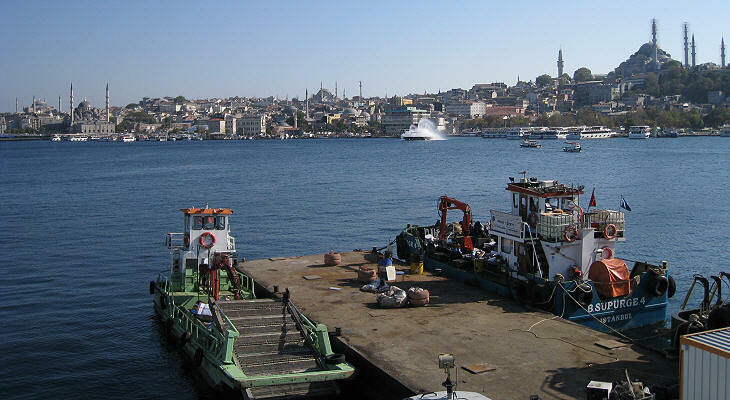 The Golden Horn was the port of the city throughout the XIXth century. 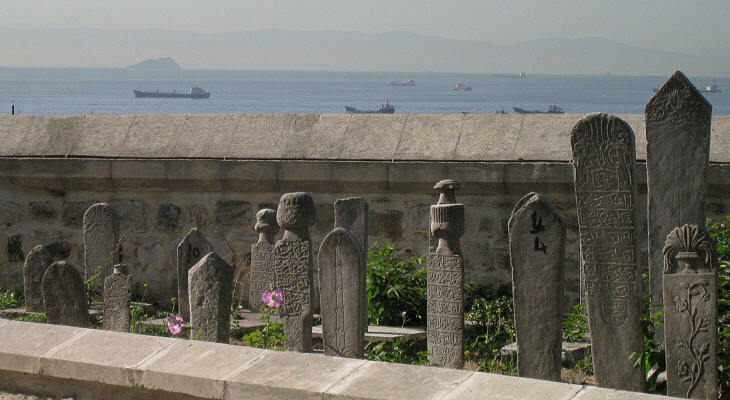 The side of the peninsula on the Marmara Sea was of lesser importance than that on the Golden Horn and even today it retains a relaxed atmosphere and it is less impacted by the urban developments which have turned Istanbul into one of the largest metropolises of the world. The expansion of modern Istanbul has mainly taken place on the European side of the Bosporus and to a lesser extent on the Asian one. The shores of the strait have lost most of the woods and meadows where in the olden days the inhabitants of Istanbul went picnicking. 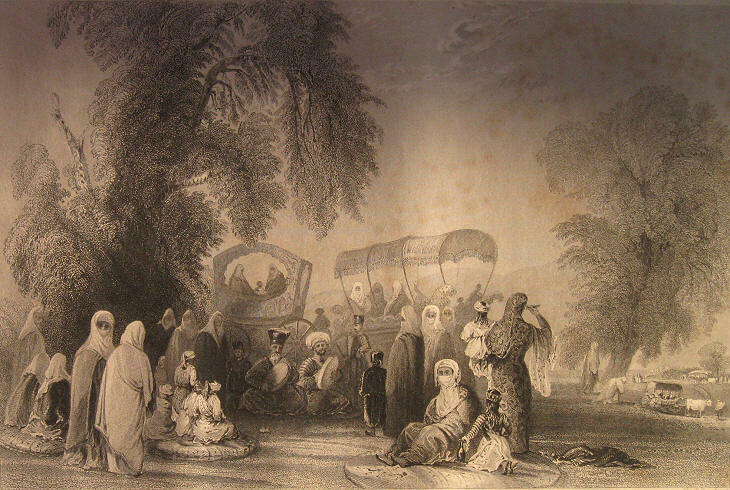 In this section modern views of Istanbul are accompanied by engravings by William Henry Bartlett, a British artist who is best known for his works on the American and Canadian scenery, but who also travelled extensively through the Ottoman Empire and by Russian engravings based on paintings by Gavriil Sergeef. The Eastern Roman Empire originated in 395 AD from the division of the empire between Arcadius and Honorius, sons of Emperor Theodosius I. Historians refer to it as the Byzantine Empire; the reference to the ancient name of the city, stresses the prevalence of the Greek element. A Greek community survived the fall of Constantinople in 1453 and it provided the Ottoman Empire with civil servants and merchants. Istanbul maintained throughout most of the XIXth century a dual identity; the capital of the Ottoman Empire and the city with the largest number of Greek inhabitants. 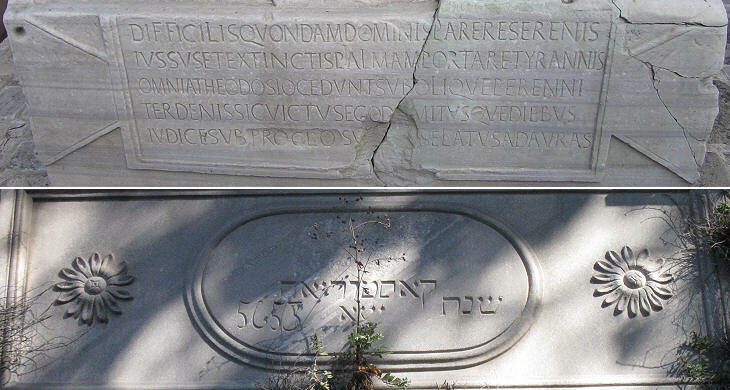 In addition to the monuments of the Byzantine and Ottoman empires, Istanbul retains memories of its ancient Roman past and of the other communities, such as the Jewish and the Armenian ones, which flourished there for many centuries. 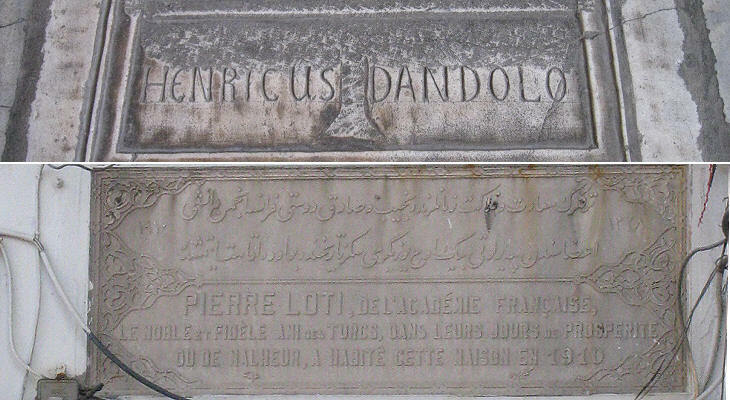 (above) Marker of the grave of Venetian Doge Enrico Dandolo (1107-1205) in Hagia Sophia; (right) inscription celebrating French writer Pierre Loti (1850-1923) near Divan Yolu, the main avenue of Sultanahmet. 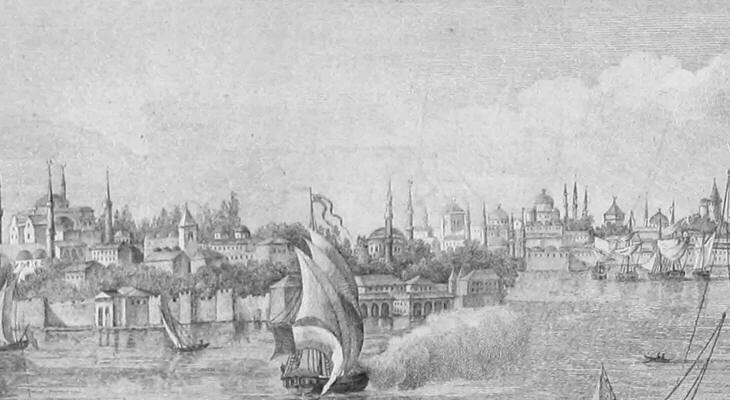 Between the XIIth and the XVth century Venetians and Genoese competed for controlling or at least having a say in Constantinople affairs; the former led the Crusaders to the conquest of the city, the latter established a colony at Galata on the northern side of the Golden Horn. In the XVIIIth and XIXth centuries many travellers came from Europe to visit the great mosques and/or to have a taste of the debauched atmosphere of a great capital at its twilight. 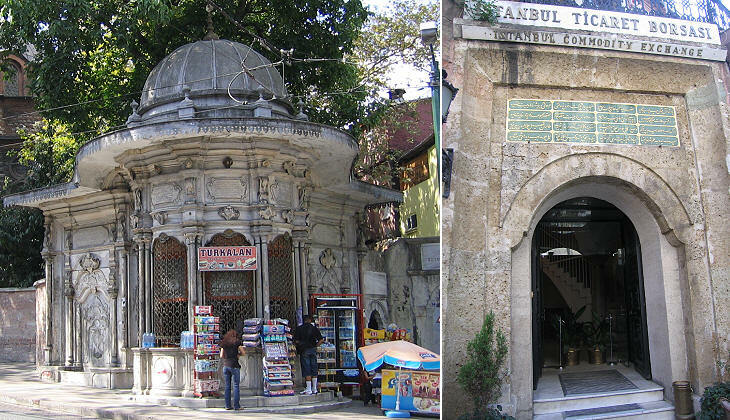 A characteristic of many monuments of Istanbul and which runs across its whole history is the use of alternate layers of red bricks and white stones; it derives from opus listatum, a Roman construction technique. The power of the Ottoman Empire reached its peak in the XVIth century and the great mosques of Istanbul were built during that century or immediately after. 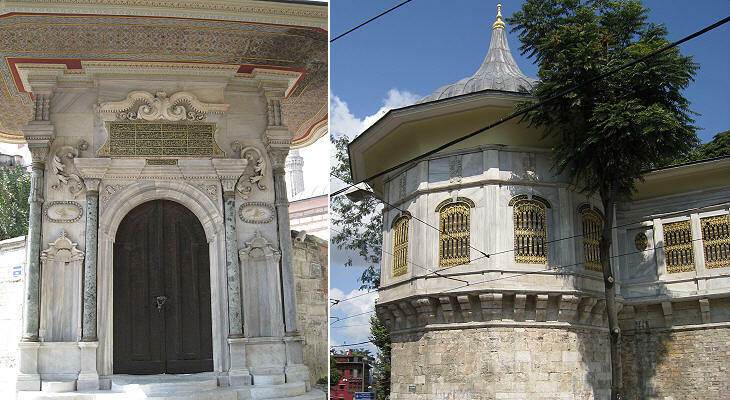 The last period of the Ottoman Empire was marked by smaller buildings which were designed according to an Oriental version of the Baroque and Rococo styles. In 1923 the city lost its role as capital, which was assigned to Ankara and in 1930 its official name became Istanbul. The Republic of Turkey under the leadership of Mustafa Kemal Ataturk introduced radical reforms aimed at emphasizing the secular aspect of the state. Many minor historical buildings which were part of religious facilities were utilized for different purposes. 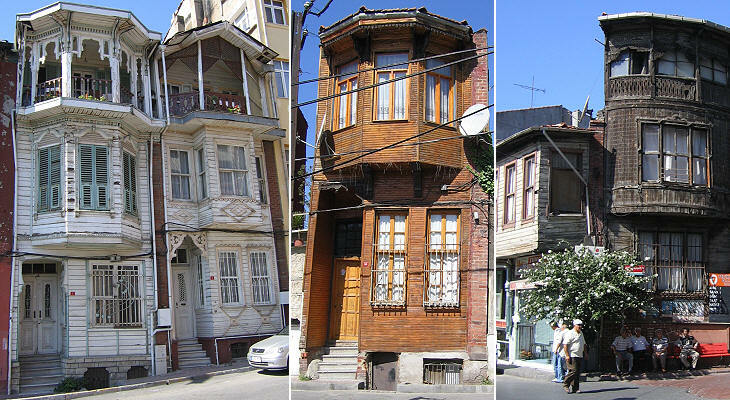 Timber houses were a characteristic of Istanbul; today they can still be seen in some neighbourhoods near the city walls. The tourist district is situated between Hagia Sophia and the Great Bazaar and it is called after Sultan Ahmet I (1603-17), who commissioned the Blue Mosque; it is mainly made up of modern buildings, some of which are evocative of the old ones. Italy is very popular in Turkey; for this reason many local designers use "Italian" brands to sell their products. I personally would have preferred Bravo Roberto (good/capable Robert), but Roberto Bravo can still be taken as a compliment. 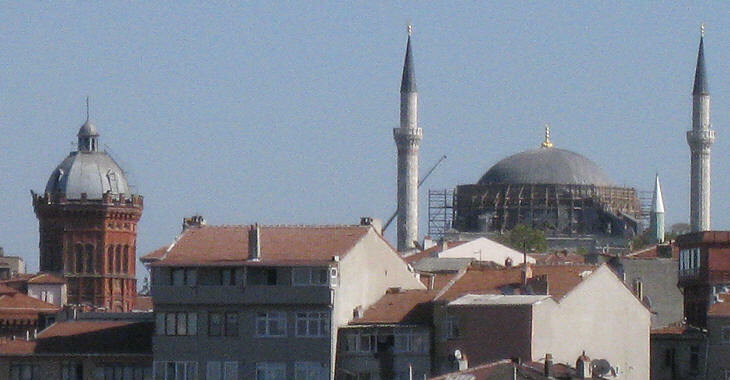 The image used as background for this page shows the dome of Hagia Sophia.